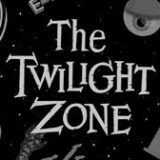 The Twilight Zone is a sci-fi, horror, mystery series, the majority of which were written by Rod Serling, the show’s creator and executive producer. 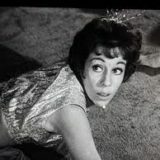 A typical Twilight Zone episode consists of some strange glitch in the normal run of events befalling its protagonist and then showing how they deal with the situation and try to resolve it. The show had its second revival in 1985 with a new colour series. 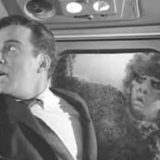 Nightmare at 20,000 Feet – Mr. Robert Wilson has spent the last six months in a sanitarium recovering from a nervous breakdown. Flying home, his nerves are about to be shattered once more when he believes he can see a creature on the wing destroying the engine. Cavender is Coming – Agnes Grep, down on her luck and behind on her rent, is sent a guardian angel, Cavender, to make her happy in twenty-four hours and earn his wings.